I assumed, that if I ever had any symptoms, they were mild and would have affected my digestive system. For the time that I have had no or very little wheat and gluten in my diet, I have been feeling much lighter, less bloated after the meal. After a meal that included gluten I felt that my body was somehow much more preoccupied with digesting the food. Something that I wasn’t actually aware of while gluten was still part of what I ate on a daily basis. Little discomforts that have been with me for years/decades, to an extent that they became part of normality. But now that it’s gone, it feels great. 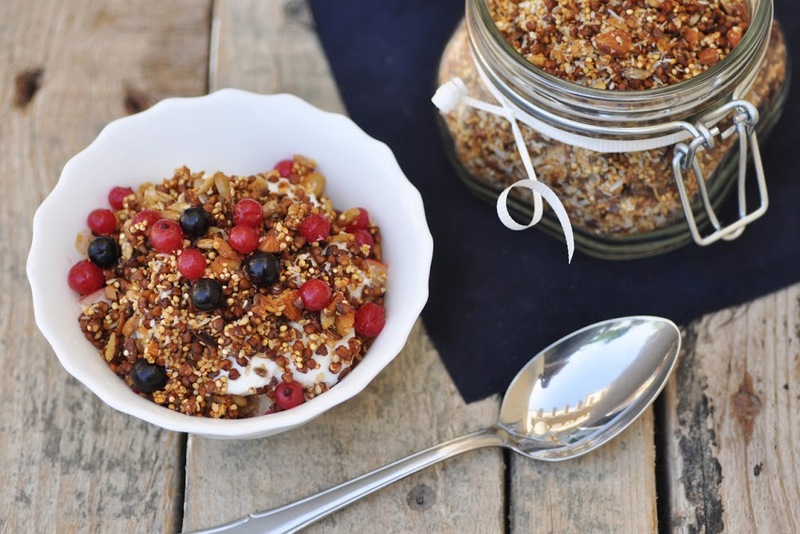 My good old granola in the morning is now an oat-free version, consisting of roasted buckwheat (kasha), millet and quinoa and a selection of nuts and seeds. I must warn you, it turns out very crunchy, and you probably don’t sprinkle as much as an oat-based granola over your breakfast bowl. But the roasted kasha gives it a deep flavor, with a hint of vanilla, that I cannot get enough of. I got a few comments on other posts in this blog, where readers mention that they don’t like millet. I actually think that buckwheat is pretty more a matter of taste, more so than millet. The buckwheat that I use in this recipe is kasha, the brown roasted groats. It is widely used in Eastern European cuisine for all sorts of sweet and savory porridge. The idea of having kasha in my granola came from a store-bought roasted seed mix containing kasha, that I usually have over my salads. Give it a try. I just love it.